Approximately 20 years ago, surgeons began practicing a new approach to performing surgery, an approach that came to be known as minimally invasive surgery, or MIS. During this era, tiny cameras in instruments called endoscopes or laparoscopes were introduced. These visual and surgical aids could be inserted in the patient's body through small ports. Although revolutionary in its positive effect on patient trauma and recovery times, MIS encountered significant technical drawbacks. The surgeon operated using a standard 2D monitor instead of looking at his or her hands. The resulting image flattened the natural depth of field, and the fixed-wrist instruments limited his/her dexterity. The lack of 3D visualization of the operative field, the poor ergonomic design and reduced control were major roadblocks to further progress. As a result, this type of MIS turned out to be suitable for a narrow range of surgical procedures. In the late 1990s, another evolutionary stage in the development of surgical technique was achieved with the application of robotics to surgical technology. 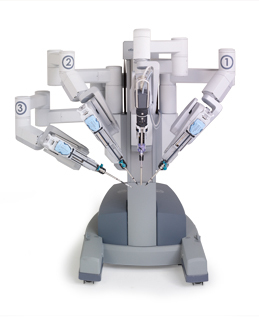 At the forefront of this new era, Intuitive Surgical introduced the da Vinci® Surgical System. The da Vinci System features wristed instruments with seven degrees of freedom, three-dimensional, intuitive visualization and ergonomic comfort. These innovations created the preconditions for minimally invasive solutions to complex procedures in a wide range of surgical specialties. Today, Intuitive Surgical's products continue to enable a new generation of surgical advancements, providing benefits to surgeons, hospitals and patients.